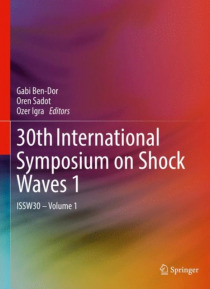 These proceedings collect the papers presented at the 30th International Symposium on Shock Waves (ISSW30), which was held in Tel-Aviv Israel from July 19 to July 24, 2015. The Symposium was organized by Ortra Ltd. The ISSW30 focused on the state of knowledge of the following areas: Nozzle Flow, Supersonic and Hypersonic Flows with Shocks, Supersonic Jets, Chemical Kinetics, Chemical Reacting Flow… s, Detonation, Combustion, Ignition, Shock Wave Reflection and Interaction, Shock Wave Interaction with Obstacles, Shock Wave Interaction with Porous Media, Shock Wave Interaction with Granular Media, Shock Wave Interaction with Dusty Media, Plasma, Magnetohyrdrodynamics, Re-entry to Earth Atmosphere, Shock Waves in Rarefied Gases, Shock Waves in Condensed Matter (Solids and Liquids), Shock Waves in Dense Gases, Shock Wave Focusing, Richtmyer-Meshkov Instability, Shock Boundary Layer Interaction, Multiphase Flow, Blast Waves, Facilities, Flow Visualization, and Numerical Methods. The two volumes serve as a reference for the participants of the ISSW30 and anyone interested in these fields.